All of our coaches are USA Gymnastics Certified and have undergone specific training through Aerial Tumbling and AcroGymnastics to assure consistency of training techniques from one instructor to another. We have a wonderful mix of athleticism, experience, and maturity on our staff and are willing to bet we have the friendliest staff in town. We all strive to teach in a well structured, goal oriented, self esteem building atmosphere. 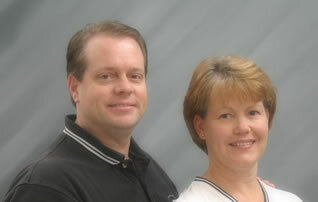 Pam & Bob have been coaching and running a gymnastics business in San Jose for the past 18 years. Pam has expertise in the area of developing the recreational gymnast and believes that even though certain athletes are not interested in competing, correct technique and good form should not be neglected.